Some people and places become inextricably linked in history. One wouldn't be quite what it was without the other. 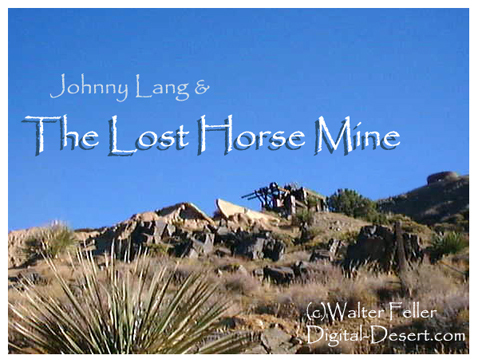 In this case, the Lost Horse Mine may have been just another nondescript, yet productive mining operation, and Johnny Lang may have not become consumed with gold fever, ultimately dying alone and forgotten in the desert. Together, they create a story that will endure in the history of Joshua Tree National Park. After the placer deposits and gold mines of 1849 gold rush played out, prospectors turned to the California deserts to uncover more of the soft, yellow metal. The deserts provided an exceptionally tough environment to work in. Summers were hot, and resources such as water and wood for fuel were scarce. It was difficult and expensive to transport equipment and provisions to the mines. Sometimes there wasn't enough gold to make the efforts payoff. This was the case in many of the over 300 mines developed in what is now the park lands. 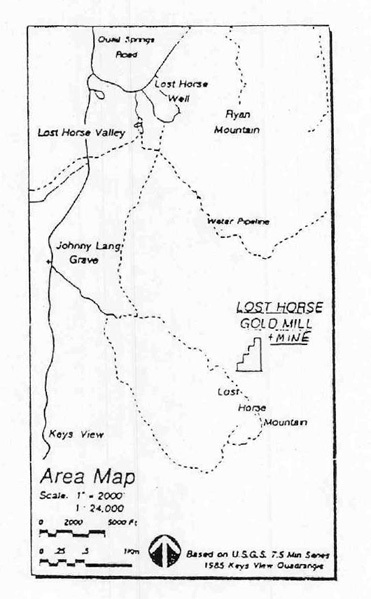 The Lost Horse Mine became an exception by producing 10,000 ounces of gold and 16,000 ounces of silver (approximately $12 million in today's dollars) between the years 1894 and 1931. John Lang was born in 1853 in Missouri. Working with his father as cattlemen, together they moved through Kansas, Texas, and New Mexico, finally ending up in California and the Los Angeles area. Seeing how important Los Angeles was to become, they threw in with some other cattlemen and purchased a grazing concession in Mexico. They began driving cattle to Los Angeles markets through Arizona and the Colorado Desert. In 1891 the Colorado River breached its banks and flowed into the Coachella Valley creating new grazing lands. Quick to see these new grasslands would save thousands of dollars in transport costs, they had moved their operation to Indio in 1893. Johnny had been grazing a herd north of Indio. One morning a horse had wandered away. Johnny followed the tracks into the dry highlands of what is now known as the Lost Horse Valley. The tracks led him to the camp of the McHaney Gang. Jim McHaney and his band of no-accounts had the reputation of being cattle rustlers and horse thieves. Menacingly, Jim told Johnny that he didn't lose his horse, and he should move on. Prospectors had been finding gold near where the Lost Horse Mine was to be. 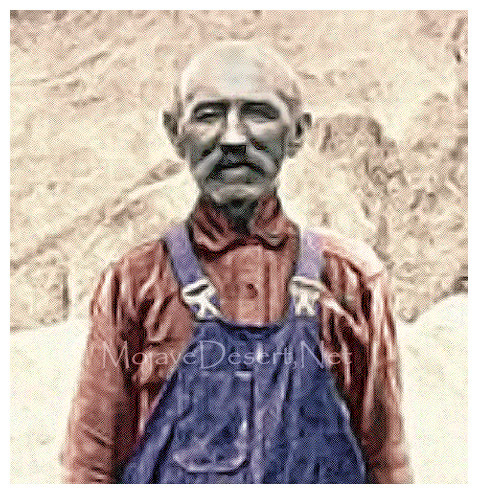 If the McHaney Gang came across a lone prospector they would steal whatever they had, threaten, and run them off. Nobody wanted to get killed over what could turn out to be a little gold in a remote and harsh location. On his way back to camp, "Dutch" Frank Diebold was the next man Lang was to run into. "Dutch" showed Johnny a piece of ore so thick with gold, even Lang, who knew little about it, could tell how rich it was. Johnny bought the rights to the strike from him for $1,000. John filed a claim immediately under the name of Lost Horse, putting his father and two others on the paperwork. The partners would help protect the claim from being jumped as well as provide capital. Digging equipment was moved in and a two stamp mill setup to pulverize the ore into dust. The Lost Horse Mine was in operation! One would think the McHaney Gang would be holding up the shipments of gold. That was not the case. The gold bullion was concealed in a freight wagon making trips to Banning 130 miles away to get supplies, a five day round trip. Lang would make these trips and soon his partners noticed the gold became considerably lighter along way. Johnny was suspected of skimming the shipment. The Lost Horse partners began selling off their shares. Ryan had made money as a cattle rancher in Montana. With the Lost Horse partners not trusting Johnny, it was easy for Ryan to buy up their shares. Johnny held out and retained his 25% ownership. Ryan wanted to open it up and make some money. In 1896 Ryan replaced the small mill with a much larger 10-stamp mill. To provide steam for the mill, Ryan ran a two-inch pipeline from a spring near his ranch, 3.5 miles away, to a reservoir he had excavated near the mill. More men were hired on. Ten just to cut wood to fuel the steam engines used to power the mill and the pumps. It didn't take the crew long to strip the nearby hills of juniper and pi�on pine trees. To this day, over one hundred years later, decent shade for a man to stand in is lacking. The battery of ten 850 pound stamps could be heard pounding rock to powder throughout the day and night. Water was added to the pulverized ore, and then the resulting slurry was washed over copper plates covered with a thin film of mercury. The gold particles clung to the mercury and the debris washed away. The amalgam of mercury and gold was scraped from the plates then strained through a chamois to initially separate the two metals. Further refinement was achieved by smelting, wherein the mercury was recovered for reuse and the gold formed i nto bricks. Johnny, while supervising the night shift, took advantage of the opportunity to increase his personal profits. It was easy for him to hold back some of the gold he'd scrape from the table. He got a little too carried away, keeping as much as 2/3 of the unrefined amalgam. Ryan hired a detective to work undercover and watch to see what Lang was up to. Soon he had hard evidence and Johnny was confronted with a choice; sell out, or go to jail. Johnny took Ryan's $12,000 offer and left. He didn't go far, just to the next canyon over. Occasionally Lang would be seen on the property spooking around. He'd be run off each time. Threatening him with jail, or worse, finally ended his trespassing. Over the next 9 years the operation seems to have run smoothly and profitably. The Lost Horse Mine reached a depth of 500 feet with horizontal tunnels at each 100 foot level. In 1905, the miners hit a fault line and lost the ore-bearing vein. In the years from 1906 to 1923 the mine was leased to others to try their hand at it, but no one made a profit from the venture. In 1931 rising gold prices prompted the processing of 600 tons of tailings (leftover low grade ore) with cyanide, producing several hundred ounces of gold. Since the mine wasn't being worked, sometime after 1923 Johnny returned to the Lost Horse setting housekeeping in the old cookhouse. According to local legend, Lang had hidden his stolen amalgam at the mill site and, unable to get to it before Ryan ran him off, had returned to retrieve his stash. Lang continued to prospect in likely spots to the west, but failed to find anything substantial-Just enough to possibly cover spending small amounts of his stolen amalgam. Local homesteader and rancher, Bill Keys recalled Lang selling him "pure gold bullion" several times. In January of 1925 Johnny tacked a note to his cabin door saying he was going for grub and would be back soon. He made it the couple miles to where the canyon opens up into the valley, and bedded down for the night. He made a small fire out of some brush to warm his hands and curl around to fall asleep. Rolling up in a piece of tarp he fell asleep--A profound sleep. Bill Keys discovered his body two months later. All that he had in his possession when he died was a small piece of bacon wrapped in wax paper. After reporting it to the county coroner, Bill returned to bury him where he was found. Stories of Lang's stash of gold persisted. Maybe he hid it in several places and didn't find all of it. Some people had thought that a map to Johnny's gold may have been buried with him. The body had been dug up twice. During the second disinterment, the skull was stolen. Lang hadn't spent much of his ill-gotten gold if he had found it. Johnny had walked everywhere he went--Probably because he'd eaten his horse and burro. Bill Keys' son Willis, recalled seeing the malnourished Johnny visit the family ranch house one day when there appeared to be no one home. Willis remained silent and hidden while Lang entered the kitchen and ran his fingers across the teeth of the meat saw, a sure way to tell if it had been used recently, and if there may be fresh meat in the house. Although today due to the settling of the mine shaft and tunnels and the ravages of the high Mojave Desert, no buildings and little but rubble, bits of building foundations and a restored mine collar remain. However, standing proud, protected, and in excellent condition, the 10-stamp mill of the Lost Horse Mine is considered one of the best preserved mills of its kind in the National Park Service. The Lost Horse is also a popular destination for visitors looking for a moderate hike. The trailhead is located off Keys View Road. The trail, which is a four-mile round-trip, follows the road developed by Ryan to haul ore and supplies. While it would be exciting to find Johnny's lost treasure, if it even exists, remember that the removal of artifacts from a national park is against the law. Lost Horse Mine and Lost Horse Mountain Hiking Trail. Distance: 4 miles (4.5 miles on loop trail). Hiking time: 3-4 hours.